As Christians, we must try to understand or know the importance and higher purposes of prayer, so we’ll always be willing and excited to pray, especially in other tongues. One of the beautiful things the Holy Spirit has done in our lives as God’s children is to give us the ability to speak and pray in other tongues. 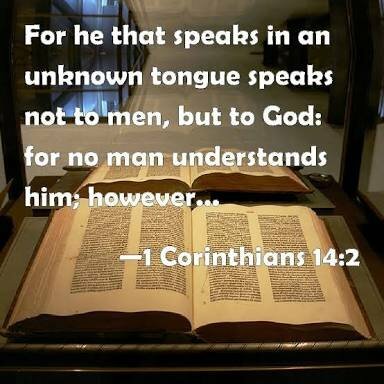 “For he that speaketh in an unknown tongue speaketh not unto men, but unto God: for no man understandeth him; howbeit in the spirit he speaketh mysteries” (1 Corinthians 14:2). When we pray in tongues, we are in fellowship with God the Father; we are communicating with Him through the Spirit in a heavenly language. What a blessing this is!!! Praying in tongues helps you to stir up the power of God resident in your spirit. Though that power came into your life when you received the Holy Spirit (Acts 1:8), you’ve got to keep it stirred up and in use for His glory. Praying in an unknown tongues will edify you and will keep you more balanced spiritually, and responsive to the guidance and promptings of the Spirit of God. The more time we spend in fellowship with God through the Spirit, praying in the Holy Ghost, the more His character and personality are revealed in, and manifested in and through us. So many people are only compelled to pray when they face crises in life, and that’s not right. We’re called into fellowship with our heavenly Father; that’s what prayer, and praying, is primarily for: fellowship with God! This is why prayer is most important because we must maintain and keep a constant fellowship with God our Heavenly Father. When we keep constant fellowship with Him,our lives transcend from glory to glory in the Holy Ghost. Dear Heavenly Father, How great thou art O Lord! Your glory, greatness, and majesty are beyond description. Thank you for your presence in my life, and your Word that builds and transforms me in ever-increasing glory. Thank you for the privilege and ability of speaking in an unknown tongues and to fellowship with you, in Jesus’ Name. Amen. Thanks for your contribution to SteemChurch, we are glad to have you here. You can do well to check other posts on the SteemChurch tag. Praying in an unknown tongues will edify you and will keep you more balanced spiritually, and responsive to the guidance and promptings of the Spirit of God.